Have clothes you no longer wear? 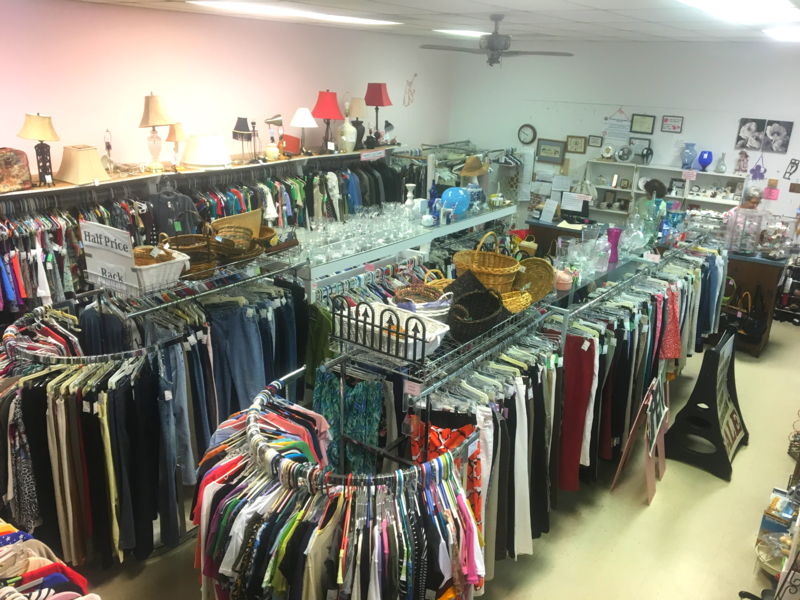 Located in the Concord Centre, off the corner of Backlick Road and Commerce Street, adjacent to the Army Recruitment Center, The Pink Elephant Thrift Shop, a hidden gem and benefactor to the Springfield community will gladly accept your gently-used items! This part-thrift, part-consignment shop accepts donations or will take, tag, and sell your clothes giving you 50% of the sale, through their consignment program! Consigned pieces are held for a five-week period, over which your items will be available for sale at the prices determined by The Pink Elephant. If your item sells, congrats! They’ll give you half of the sale and the other half will go towards local charities in the community. If your item doesn’t sell, pick it up on the last day of the five-week period and take it home, or it becomes property of The Pink Elephant. The Pink Elephant is run by The Woman’s Club of Springfield, a member of the General Federation of Women’s Clubs, and is a quaint, philanthropic boutique that raises money for local community programs. The Woman’s Club of Springfield hosts an annual scholarship contest in which they award a $3000 scholarship to an exemplary graduating female senior from either Lee High School or West Springfield High School to be used towards a college or university education. The Woman’s Club will continue this scholarship annually provided the student succeeds in their college courses. The Club also provides snacks and emergency clothing to both Crestwood Elementary and Garfield Elementary, as well as routinely donates money to Bethany House, a non-profit that provides shelter and counseling, among other services, to victims of domestic abuse. However, a lesser known benefit of thrift shopping is the global reduction in waste that is facilitated by the reuse and repurposing of used items. By choosing to buy clothing from thrift shops, you’re actively sparing the environment gallons of dye that would’ve been dumped into the ocean and pounds of CO2; that would have been released in the transportation of your garment from field to factory to storefront. A single cotton t-shirt shipped from XInjiang, China to Los Angeles produces over two pounds of CO2; emissions! From one shirt! According to the Environmental Protection Agency, in 2010 it was recorded that the average American produces more than 85 POUNDS of textile waste PER YEAR. Cut down on your personal waste by taking your clothing to consignment stores like The Pink Elephant, rather than the landfill, and make a quick buck while you’re at it! Anything The Pink Elephant cannot sell within their five-week period, will be marked down, and the garment will flow through the store until it reaches the $1-$2 rack. From this rack, anything not sold will be taken to another local thrift store, like the Fort Belvoir Thrift Store or Goodwill. Prices generally range from $3 to $15, with a few exceptions for high-end items that may reach as high as $18-$20. Stop by The Pink Elephant to shop 10 a.m. to 3:30 p.m., Monday through Thursday and Saturday (closed on Friday and Sunday). Consignments are accepted any day they are open from 10 a.m. to noon. They accept a broad range of items, including: women’s clothing, men’s clothing, women’s and men’s shoes, purses, jewelry, household items, collectibles, linens, pictures/frames and luggage. The only items they cannot accept are children’s clothing or pillows and cushions. Stop by The Pink Elephant and make a buck, save a buck (and the environment!) all in one trip! Contact The Pink Elephant, 703-451-2467, 6127-B Backlick Rd, Springfield, VA.
Julia Reynolds is a marketing student attending Florida International University in the fall of 2018 and is the creator and editor of her own blog, LiaSkye.com.